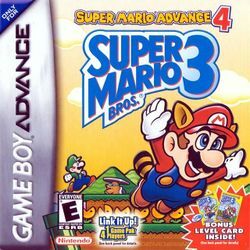 Super Mario Advance 4: Super Mario Bros 3 (スーパーマリオアドバンス4, Suupaa Mario Adobansu fou?, lit. "Super Mario Advance 4") is a platform game that was developed and published by Nintendo for the Game Boy Advance. It was first released in Japan, and then later released in Europe, North America, and Australia. It is an enhanced remake of the NES game Super Mario Bros. 3, and is based on the remake found in Super Mario All-Stars for the SNES. It is the fourth and final release in the Super Mario Advance series. The game was first revealed at Nintendo's conference at the E3 2003 convention. It contains several enhancements, including the addition of Mario and Luigi's voices by Charles Martinet, the ability to scan e-Cards into Nintendo's e-Reader to add certain content, and a multiplayer mode based on the original arcade game Mario Bros.
Super Mario Advance 4, excluding the European version of the game, is compatible with the e-Reader, allowing players to scan certain e-Cards into the device utilizing two Game Boy Advances, the e-Reader, and a copy of Super Mario Advance 4. Once a card is scanned, it adds certain content to the game. One of the most prominent features included is the ability to add stages to the game; the player is allowed to have 32 extra stages on one copy of the game. E-Card types also include the demo card, which allows players to view tips and tricks as performed by the developers for certain stages; the power-up cards, which allow players to add certain power-ups to their inventory, depending on which card they have; and the switch card, which causes changes to the game, such as adding throw-able vegetables from Super Mario Bros. 2 and causing enemies who have been hit by fireballs to turn into coins. Two item cards introduce new items to the game. The more common of the two is the Cape Feather card, which gives players said item from Super Mario World. This page was last edited on 22 January 2016, at 23:19. This page has been accessed 37,052 times.